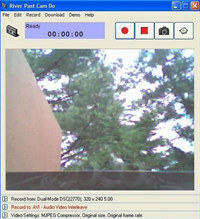 River past cam do is a easy-to-use, fast, and powerful webcam video recording software. It is compatible with most webcam models and compatible with multiple installed cameras. Output to avi, divx, mkv, ogm, wmv or xvid, with choices of video codecs and quality setting. It loads the video compressors dynamically on your system for the best power and flexibility. Common codecs include cinepak, indeo 3, 4, 5, microsoft video 1, motion jpeg, divx and xvid. Use the latter two for the best speed and quality. Optionally audio can be recorded from any sources, including microphone, line-in, or speakers. Recording volume can be adjusted manually even during the recording. Full control over the audio codec, sample rate, channle, bits per sample, and bitrate. It has a built-in scheduler for unattended recording. You can set the start time and/or the stop time. With the optional mov booster pack, you can output to quicktime movie. River Past Cam Do Webmaster Edition is an utility that works under windows xp, windows vista, . It supports both 32-bit & 64-bit windows editions, therefore it could run faster on 64-bit computers. Estimated download time for River Past Cam Do Webmaster Edition on a common adsl connection is less than a minute. Version 3.8 was released three thousand three hundred thirty seven days ago by River Past Corporation. Click the green download button to download it now.